Ruth M. López is a senior research associate at the Annenberg Institute for School Reform at Brown University. Community partnerships allow schools and districts to empower and engage a broad range of English learners and their families in culturally responsive ways to support student learning and socio-emotional development. I was once an English learner. I am the daughter of immigrants from El Salvador and México. When I was born, my parents were learning English, and they communicated with me in the most natural way they knew – in Spanish. This was not framed as a “problem” until I was enrolled in pre-school. The earliest and most vivid educational memory I have is of my young mother advocating on my behalf that my fluency in Spanish did not imply low intelligence and did not justify my being held back in school. Eventually, she found a school that would teach me English in the age-appropriate grade, but from a young age I was sent the message in school that my native language was one that needed to be kept in the home. My cultural heritage was rarely reflected in the curriculum I was learning – so rarely that I easily recollect the experiences I most value in my K–12 education: the time in fifth grade when we created a booklet highlighting natural resources from different countries, and I glued coffee beans to construction paper, drew coconut trees to represent El Salvador, and proudly drew the map of my mother’s country; and the time in high school when I read Bless Me, Ultima by Rudolfo Anaya, the first book I read by a Mexican-American author, leading to my wanting to read any book by an author with a Spanish surname. Once I was exposed to these ways of learning that reflected my cultural heritage, I became passionate about learning more about Latino culture and history and pursuing my education beyond high school, eventually earning my Ph.D. in education. Numerous local and national Latino organizations supported this process for me, but not until later in high school. I think now about how different my early educational experience would have been with more exposure to culturally responsive curriculum, including greater ties with community organizations. I share this story to introduce the theme of this issue of VUE: the rich experiences that partnerships between districts and community institutions, such as nonprofits and universities, can provide for children of diverse backgrounds. The theme was inspired by the Summer English Language Enrichment Academies held across twenty school districts in Massachusetts. Three of the articles focus on programs that resulted from this grant, and we also include the perspective of programs serving similar populations of students in California and Texas. As part of this agenda, the EOE in 2013 and again in 2014 awarded twenty Gateway City school districts across Massachusetts a total of $3 million in competitive grants to support intensive summer English language learning for middle and high school immigrant and newcomer students. During the summer of 2014, these academies served nearly 1,700 students. Originally, the summer academies were to be funded for 2015. However, the 2015 funding was cut as part of efforts to close a $768 million state budget deficit. Each summer academy was required to have an academic and enrichment component. The programs were allowed to create their own curriculum and choose formative and summative assessments, and they were encouraged to collaborate with nonprofit organizations and/or institutions of higher education. The Annenberg Institute for School Reform at Brown University (AISR) served as external evaluator of the Gateway Cities grant program. Through mixed-methods evaluation that included assessment analysis and qualitative findings from six case studies, we documented the program design, conditions, and outcomes of these six academies. We observed that community partnerships were key to the successful implementation of the academic programs and to positive youth identity development and empowerment. In four of the six sites we visited, we witnessed strong partnerships with community organizations to develop an engaging, well-rounded, and supportive summer academy. Although the focus of the Gateway Cities initiative was on English language development – and we documented increases in pre- and post-test assessments during the summer for all twenty academies – we also witnessed learning taking place through culturally responsive teaching, often provided in partnership with community organizations in the form of enrichment curriculum. Community organizations helped with curriculum development, served as enrichment curriculum partners for informal and formal learning, and offered parent and family engagement and supports. Although these relationships took place in the summer, many extended into the school year in the form of after-school programming. In all of these instances, partnerships increased the resources available – specifically for ELLs in the case of this grant program. The partnerships we observed underscore that schools exist within larger communities. This understanding is an essential part of AISR’s framework of “smart education systems,” which we describe as a high-functioning district or other local education agency with a range of civic and community partners that provide a broad network of opportunities and supports to young people in and out of school. Our evaluation of the Summer Academies was guided by AISR’s mission and core principles, along with research on best practices in educating traditionally underserved populations like English learners. A focus on equity and social justice are the foundation of all our work.4 We take an asset-based view of bicultural English language learners (Tung 2013) and value culturally responsive pedagogy, which recognizes and builds on the knowledge and experiences students bring to school (Padron, Waxman & Rivera 2002; Tharp 2000). When students see their lived experiences and communities reflected positively in the curriculum, it strengthens student engagement and increases the relevance of academic learning (Cammarota & Romero 2014). This perspective views ELLs not as lacking language skills, but rather as having something to offer our schools and communities. The goals of the Gateway Cities grant included increasing the capacity of the Gateway communities, and ELLs have the potential to contribute to these cities for years to come. The ELL academies offered what Theoharis and O’Toole (2011) define as an inclusive education experience: “providing each student the right to an authentic sense of belonging to a school classroom community where difference is expected and valued” (p. 649). Due to the structure of the grant program, districts provided students with a safe space where their unique experiences as newcomers and/or immigrants were valued. The grant allowed program designers to “rethink school structures” and “instructional techniques” during the summer. These elements are key in school models that are not only inclusive, but that also wish to foreground equity in education. 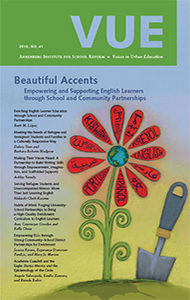 The issue opens with an article co-written by Barbara Roberts Hodgson, a lead ELL teacher and newcomer support teacher, and Dahvy Tran, a former refugee and now the youth program coordinator at the International Institute of Lowell, Massachusetts. Both women work daily with refugee and newcomer students and families in the Lowell community, and they share their most recent experience collaborating during the Gateway Cities Summer Academy and into the school year, especially their collaboration to increase family engagement. What stood out to me is how they challenged the kind of blame often aimed at newcomer parents: “Why didn’t the parents just jump in their cars and show up? Isn’t this what parents who are really interested in their children’s education would do? Why was it so difficult to foster parental involvement?” Hodgson and Tran show that to answer these questions requires knowledge of the difficult reality faced by new refugee families; they also highlight the importance of building trusting relationships with parents. Ashley Varady, a program manager of the after-school writing program 826 Valencia in San Francisco, then shares the story of the partnership between her program and a K–8 school with a high number of students who are English learners. Her article shows the imagination and growth that can result when students are given creative freedom and the tools to write. Also in the Bay Area, Nakachi Clark-Kasimu, formerly the after-school coordinator at the San Francisco– based nonprofit Refugee Transitions, shares her experience working with unaccompanied youth from Central America. During the summer of 2014, this group in particular received much attention in the media, when their migration due to crime and poverty in their home countries was described as a “surge.” Clark- Kasimu shows that beyond learning English, these youth need a range of advocates and partners, including the school and community-based organizations, to help them through legal and social processes as they become part of American society. Amy Cournoyer Gooden, a lecturer at Boston University, and Kelly Chase, the assistant superintendent of Malden Public Schools, write about their partnership, which began during the application process for the Gateway Cities grant. They co-designed and later implemented the Gateway English Learner Reach for the Stars Academy, with a curriculum that was connected to the lives of students. Next, Jessica Rivera and Mary Jo Marion of Worcester State University’s Latino Education Institute and Esperanza Donovan-Pendzic, the host of the Spanish-language television program Esperanza y Su Éxito, share their experience in a collaboration between the district and several community organizations that engaged families and provided students with a culturally responsive and empowering enrichment program. We close the issue with an article about a culturally relevant Saturday school in Austin, Texas, called Academia Cuauhtli. This article was co-written by members of Nuestro Grupo, a community-based organization that led the effort to found the academy, including leading education scholar and University of Texas at Austin (UT-Austin) professor Angela Valenzuela; historian and UT-Austin professor Emilio Zamora, who initiated the Texas History Curriculum Project; and Brenda Rubio, doctoral student and member of Nuestro Grupo. Their piece offers a novel approach to educating Mexican-origin children and the children of immigrants by embedding ancient ways of learning into curriculum. We hope that the perspectives gained from all the articles in this issue together help to inform districts and communities that have the goal of educating students often labeled as “English learners” in holistic ways that include, but extend beyond, English language instruction. Cammarota, J., and A. Romero, eds. 2014. Raza Studies: The Public Option for Educational Revolution. Tuscon: University of Arizona Press. Padron, Y., H. Waxman, and H. Rivera. 2002. “Issues in Educating Hispanic Students,” Yearbook of the National Society for the Study of Education 101, no. 2:66–88. Tharp, R. G. 2000. Teaching Transformed: Achieving Excellence, Fairness, Inclusion, and Harmony. Boulder, CO: Westview Press. Tung, R. 2013. “Innovations in Educational Equity for English Language Learners,” Voices in Urban Education 37:2–5.